This morning Lilah started asking about Christmas. With her fourth birthday now more than a month behind her it seems to the natural thing to start contemplating. As a warm up, she started trying to remember presents from last Christmas. “Daddy! Daddy! You gave me those baby scissors!” she exclaimed, running over to her little table sitting in the middle of the kitchen and pulling out a pair of 4-inch miniature yet quite sharp scissors. She uses these most every day, though we almost lost those on a plane ride to Seattle this summer when we unthinking brought them in carry-on. I was both relieved and flabbergasted when the security inspector pulled them out, looked at them, and decided that they were OK to bring aboard. Mat? Mat? What mat? I thought and thought until I remember, with a little shock, that for my own amusement, I got Lilah a plastic “Nine Planets Placement” for Christmas last year that had nice photos and facts of all nine (ahem) planets. It had gotten shoved under a pile of other placemats in a drawer, but I dug down, pulled it out, and Lilah cheered. Lilah’s placemat drove home a likely part of the problem. Most people have absolutely no idea what the solar system actually looks like. 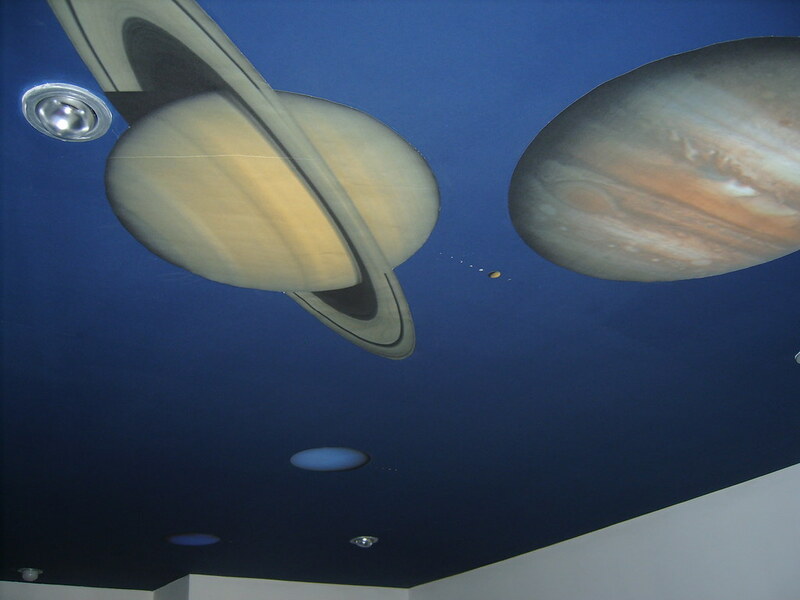 They see pictures of planets of placemats, on lunch boxes, on walls at school, but none get the scale of the solar system even remotely correct. Why? First: it’s boring. The solar system is mostly empty space. How much empty space? If you were to draw a top-down view of the solar system from the center out to the edge of the Kuiper belt, it would be 99.999999% (that’s 8 nines, if you’re counting) empty. And 99% of that non-empty fraction is taken by the sun. Making a placemat with that much empty space is pretty dull (though presumably you would save on printing costs). I would show you here what it would look like, except that you would need to view it on a monitor with 12,000 pixels across (about 10 times your typical laptop screen). The sun would occupy only one pixel in the center. You’d see nothing else. If you had grown up with a picture of the real solar system on your placemat, you would be forgiven for thinking the number of planets was precisely zero. We need a better placemat. What’s the solution? There is no choice except to dispense with trying to depict both the distances between planets and the sizes of planets on the same scale. You can do a little better if you shove the sun almost out of the frame, keep the relative distances between the planets correct, and exaggerate the sizes of planets by a factor of about 8000. This solution still does not make for a great placemat. It’s still mostly empty space, and most things are too small to see well. If Jupiter is going to fit on your placemat at all (and let’s not even talk about the sun), Mercury is going to be so small that it will look like just a tiny dot (and, again, let’s not even talk about Pluto, which is half again smaller). If you had grown up with this placemat you would probably have a lot of respect for Jupiter and Saturn and wonder why everyone made such a big deal about the rest of them. As a placemat maker, there is one other step you can take while still maintaining scientifically integrity. You can keep the planets in the right order, but give up on showing their true distances from each other. Shoving the planets together a bit more allows them all to be somewhat bigger. Now you can even make out Ceres, the largest asteroid. The band of tiny Kuiper belt objects begins to be visible. There is a solution, of course. Forgo almost everything. You’ve already had to throw away the correct relative spacings between planets to make the placemat more interesting. Now also throw away the correct relative sizes! Make Jupiter and Saturn significantly smaller, make the tiny tiny terrestrial planets significantly bigger. Grossly exaggerate the size of puny Pluto. This is the perfect solution. This is Lilah’s placemat. I find this solution perfectly awful. My objection here is not the inclusion of Pluto as a planet (that’s just anachronistically cute, sort of like ‘here be dragons’ on an old map), my objection is that everything about the solar system is so wrong that of course people are going to be generally confused. How could astronomers possibly vote to get rid of Pluto when there it is, as big as Mercury, nearly as big as the earth itself? Just how bad is it? If you take Jupiter to be the right size and scale everything from there, Mercury, Venus, Earth, and Mars should be 6,4,4, and 5 times smaller, respectively. The smallest ones, Mercury and Mars, are the most exaggerated. The giant planets are a bit odd. Saturn is actually 80% too small, presumably because its rings take up too much space to be aesthetically pleasing. Uranus and Neptune are 1.2 and 1.5 times too big, respectively. And Pluto? It remains the runt even in this solar system, where its size is exaggerated by a factor of 10. If you grew up with a placemat like this, or a wall poster in your third grade classroom, or a lunch box you carried every day, I now understand why you feel Pluto still deserves to be a planet. It’s because you and I are talking about entirely different solar systems. Even I would agree to Pluto’s special place in the solar system of Lilah’s placemat. Sadly, that solar system and the real solar system have little in common. I do have a better solution for the placemat makers out there. It keeps the relative sizes of planets correct and keeps their ordering correct, but, like all of the ones above, it has to dispense with the relative spacing between planets. The trick, though, is to pile the planets on top of each other, and to not even show all of the monster Jupiter. You can pack much more into the frame, like this. There is room on this placemat to put real depictions of the planets. And you can even see many of the dwarf planets out in the Kuiper belt. If you look carefully, you can see the elliptical Haumea and you might even be able to identify a few other of your favorites. Imagine a world in which this was the image that children – that adults! – had of the solar system. Would we even be having conversations about Pluto’s planethood? It seems pretty unlikely to me. Rather, we would talk of the great difference between giant planets and terrestrial planets, we would talk of the band of asteroids, and we would talk of the ever-increasing number of tiny icy objects out there on the very edge of the solar system. In short, we would talk science rather than definitions. But, occasionally, we would remember the old solar system of our youth and talk nostalgically to our children, and say “when I was your age, Pluto was still a planet” and then, when our child looked up quizzically, we would look down in the corner of the placemat, and try to point out the former planet amongst those many many objects and realize that we had absolutely no idea which tiny point it even was. Frequent commenters will notice something odd starting this week: the comments are now moderated and require approval before being published. I am not a big fan of moderating comments. It requires work on my part, for one thing, but more importantly I am a a big believer in a free exchange of ideas. That said, I have become increasingly disheartened by some of the more strident comments that have appeared here. While I believe a free exchange of ideas is critical, I also believe that civil behavior should be a minimum requirement of anyone participating in such an exchange. So: comment away! Disagree with me! Say why I'm right or wrong! Disagree with each other! I will not stifle debate, but I will stifle incivility. I can only approve comments when I am reading email, so don't fret when your comment does not appear immediately. but then your last paragraph made me think of a bowling game. In what order would you play the planets to get as many pins as possible? Surely Pluto wouldn't be 9th, right? When I taught astronomy to middle and high school kids, one of their favorite projects was the "Correct the Solar System Model" - I would buy a few different commercially available solar system models and challenge the students to come up with a list of what was wrong with the model. One particularly nit picking - I mean "detail oriented" group came up with over 100 for theirs! They had a blast with it. You could even put moons on that last one (maybe near the center of the planet they orbit?). That way you could get all of the non-self-luminous objects in the solar system onto the placemat. Designing such a placemat would be a great high school astronomy project. Myself, I'm waiting for the "smart placemat" to turn up. It'll have an interface like an iPhone, where you can zoom in on your favorite region of the solar system with the flick of a finger. You could even animate it to show the relative speeds of the orbits, from Mercury all the way out to Sedna. Or you could focus on Jupiter and watch its moons. If you get the Internet-capable model, you'll be able to download updates. But will it fry when you spill grape juice on it? This is an excellent point, Mike. I also had not made the connection between the power of those images and the confusion we have seen the past few years. One antidote might be true scale models of the solar system. We are fortunate to have one here in Ithaca (the Sagan Memorial PlanetWalk); the Sun is about a foot across and at the center of downtown, while Neptune and Pluto are 3/4 of a mile away at the science museum. I don't know if there are many such things in California; but perhaps Caltech would be interested in setting one up! I was glad to be able to refer to the PlanetWalk when I was teaching kids about the solar system this spring. But even here it is hard to compare the sizes of the planets relative to each other, so your modified placement has a valuable place. That's an excellent visual aid. Funnily enough, at the weekend I came across this essay by Neil deGrasse Tyson on the controversy, and realised there's a marvelous psychological test: how would you redraw the Pioneer plaque in the light of our current understanding? Omit Pluto, add several more Plutoids, or represent the dynamical families of small objects in some way? I've seen one depiction of the worlds of our solar system in correct relative size. See the magazine special 'Scientific American Presents Magnificent Cosmos' from circa April 1998 (says "display until May 1998" on the cover) Page 26, 'Planetary Tour'. It shows to scale in true relative size parts of Jupiter and Saturn with Ouranos(my corrected spelling) & Neptune directly below them in full, then in order, Earth, Venus, Mars, Titan, Mercury, Ganymede, Callisto, Io, Moon, Europa, Triton, Pluto, Titania, Rhea, Oberon, Iapetus, Charon, Umbriel & Ariel. This was before the larger TNO's had been discovered so an updated version would be interesting to see. It also includes a table & some text. I like this depiction so much I've had it colour photocopied and laminated to use as a poster. If you'd like, I'll try scanning it & sending you a copy or you could try & track it down from the info. included. For the record - I favour an inclusive and broad definition of 'planet' & then subdividing planets into major classes. I consider Pluto and the other ice dwarfs to be planets & there to be 3 main classes of 'planet' in our solar system, gas giants, rocky terrestrial worlds and ice dwarfs. c)large enough to be round or if rapidly spinning oblate spheroidal rounded through its own gravity thus not a comet or asteroid. SteveoR, your classification system makes the most sense. If it means our solar system has hundreds of planets, what is so terrible about that? This got me thinking about planet classifications and I started to wonder - if we had evolved on one of the gas giants, would we consider the solar system to have 4 planets and a sun, all of which have both spherical and non-spherical moons? Your post has sparked all manner of interesting thoughts, Mike, and I could probably write three or four terrifyingly large comments about different issues you've raised. Unfortunately, that might run me afoul of my rather own liberal rules on procrastination control. So I'm going to pick one. I think one of the big reasons that Plutophiles are so attached to planethood stems from how pretty much every elementary school student comes to learn about the solar system: we think of it as a collection of planets, no more, no less. It starts on places like Lilah's placemat and posters and lunchboxes. But open up any fourth grade science textbook--be that one from the 1950s or 1990s--and you'll see that their chapters on astronomy are laid out in pretty much the same way. You get a quick mention of the sun (if you're lucky), then consecutive sections starting with Mercury and ending with Pluto. Each kid is expected to learn one or two basic characteristics about each planet (ie, Mars = red; Jupiter = big; Saturn = rings) and learn their order from the sun. This basic arrangement of facts is repeated whenever, say, the Magic School Bus takes a trip through the solar system. By virtue of the fact they suffer the indignity of orbiting around another world rather than the Sun, bodies like Io and Europa and Titan basically vanish altogether from a childs-eye-view solar system. Yes, those moons might eventually appear briefly in their parent planet's section in the book in seventh grade, but by then the picture is kind of set. Indeed, even our own moon gets pretty limited play in introductory astronomy, at least in the context of being a "member" of the "solar system." But the childs-eye solar system IS the solar system of pretty much all non-astronomers. That's not to say the educated layman didn't get quite intrigued when Huygens took its plunge, but rather that this Titan place was a sort of late paste-on onto the initial mental map they had of a nine-planet solar system. For lack of a better term, there was a "planet-ist" bias at play when we were all taught what the solar system was. 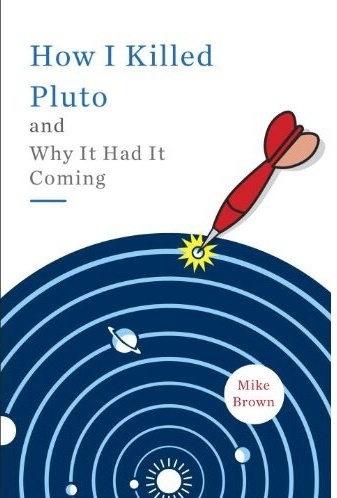 No wonder, then, that when Pluto was reclassified there were various irksome lines in the press about it getting "kicked out" or "dropped from the Solar System." Bound up in Pluto's planethood is this fear that if it isn't in the same club as the other eight it simply won't count anymore. It's silly, but in a world where most educated people's mental pictures of the solar system look like those placemats, it's somewhat valid. I guess the real question is what to do about it. 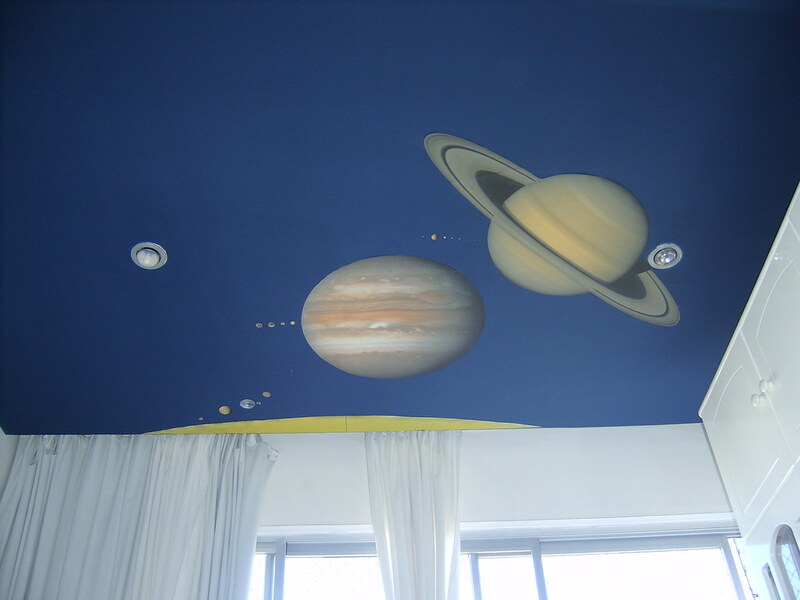 Yes, the eight planets will always enjoy a certain sense of top-of-mind prestige, but we really need to do more to ensure that non-planet members of the solar system get the shrift they deserve when kids learn about the solar system in the years to come. We can't expect Lilah and her schoolmates to be running around the playground rattling off some sort of Ceres-Vesta-Pallas-Hygieia singsong bit, but it would be cool if they learned about volcanoes on Io the same time they learned about gigantic cyclones on Jupiter. I like the idea of planetary placemats, but I think it would be a terrible misrepresentation to leave the asteroid belt and the Kuiper Belt objects off the mat ... almost as bad as making Pluto bigger than Mercury. That's the problem with trying to limit the planetary tribe to eight, in my humble opinion: You lose the sense of diversity in the solar system. I can imagine that even Lila (or other kids) would feel let down if they didn't see that little string of pearls in the lower right. Whether you call them the pearl planets, or dwarf planets, or ice worlds, or KBOs (which is about the least evocative label you can put on a planetary pigeonhole), I'd have to insist that "the kids stay in the picture," to paraphrase Darryl F. Zanuck. Alan - wait wait wait wait! Did you look at the pictures? Everything orbiting the sun that is big enough to appear as large as one pixel across is there, with no human-made distinction. The only distinction is the real one between the 4 really big things, the 4 moderately big things, and all of the small things. It's not me limiting the planetary tribe to 8, it's just nature! If you grew up with a placemat like this, or a wall poster in your third grade classroom, or a lunch box you carried every day, I now understand why you feel Pluto still deserves to be a planet. This makes a lot of sense when understanding the reactions of taxi-drivers who implore scientists to 'reinstate Pluto'. It's less convincing (at least by itself) when trying to understand why tenured Professors of Planetary Science get so hot under the collar. I have my own theories ('IAU rules geology still more boring than astronomy' - Prague, 2006) but I'd like to hear what other people think. I'd like to see a planetary placemats of other star systems. Would the IAU definition of a planet still stick? So how can we get one of these placemats? Who even makes the things? exodwarf refers to a vertically-challenged commanding officer. exodwarf. like "If that actor Tattoo from Fantasy Island had been in the marines, he would have made an excellent exodwarf". Exodwarf. This hang-up on size perplexes me. A dust mite and an apatosaur have an enormous size differential, yet both are recognized by biologists as animals. What biologist would deny that anything smaller than a hummingbird cannot be labeled an animal simply because it is too small? Or that a dust mite doesn’t “deserve” the label of animal because it isn’t as big or “important” as a brontosaur? Or that a line must be drawn somewhere because otherwise there would be too many animals? Sorry, but the logic totally escapes me. Also, I wonder how these planet definitions will possibly survive future observations. As planet detection around other stars improves, it seems quite possible, even probable, that astronomers will find at least one Earth-size or larger body that has not cleared its orbit of debris. And what will happen if astronomers get really good at finding stuff and detected some small, icy body orbiting a red dwarf all by its lonesome? For that matter, what happens when we find some Jupiter-sized body wandering between star systems? I guess we’ll call it a “rogue planet?” So then we’ll have rogue planets, dwarf planets, ghost planets, evil planets, etc., but none of these will “really” be planets? Aye aye aye! My head is spinning like a neutron star! Our Solar Systemcentric definitions for exoplanets would have been better not made but everyone was expecting one defintion offered by the IAU for both exo and ino (yeah I just coined another word candidate) planets. Whoops that was me talking about exo and ino planets. Firstly, I agree with previous commentators that any depiction showing objects smaller than Mars needs to show moons as well. Moons are interesting. After all, how many of your research-related posts this year have been about satellites of one body or another? I'd LOVE to see a mission like Cassini to each of those big planets, as I expect that they could discover lots of interesting stuff out there. I also like the fact that there are all those other spots on the mat. That's just as it should be. I worry that by artificially limiting the list to eight (or perhaps four, if a Neptunian was in charge of the job), folks limit their view of the solar system when it actually should be widened. This isn't a placemat, but the ceiling of my daughter's room. I did this about 6 months ago when she started getting interested in learning about "outer space" (she's 5). I put all of the planets, the larger moons, plus the dwarf planets and named TNOs. The sizes are correctly scaled, and the distances from the sun are correctly scaled (of course not on the same scale as the sizes). Looking towards the outer solar system (the named TNOs are there after Neptune, but I don't have a good picture uploaded that shows them well). May I make a couple of quick suggestion for your placemat? You could restore the relative distances by scaling the x-axis just as you did in your first attempt, but keep the planet scales the same as in your last. Draw vertical lines down the paper showing the orbital distances of all of the bodies which are primarily orbiting the sun. 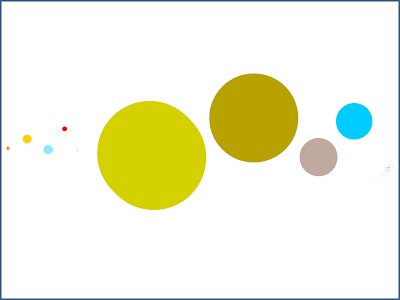 Each planet would then be drawn horizontally centered on it's orbit line (vertically placed to be ascetically pleasing). For planets with high eccentricities, the orbit line could be two-toned. 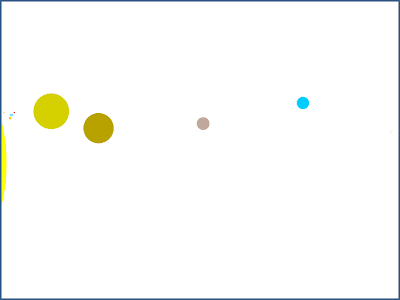 A light color bar displaying the full width of the orbit, and a darker color for the mean orbital distance. 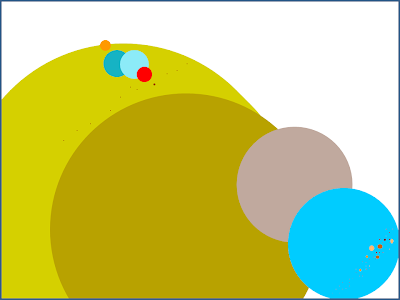 The moons could also be restored on this map by rendering them on small circles, with similar distance and size scales. distances scale negative-exponentially with distance from NY. After some experiments, I decided a power function preserved information better. maps the Solar System with both diameters and semimajor axes scaled as a 3/4 power. Oh My God, this is perfect! As a elementary teacher, I am constantly battling small children's ideas, as well as other adults (teachers, no less) in giving up the idea of pluto as a separate planet. I love showing all the other TNO/KBOs and asteroids on my planetary wall! Now the placemat idea #3 is perfect for me to show my students! I think this might actually help some adults get the right idea! Thank you! Thank You! from science teachers eveywhere! I bought this placemat at WalMart a couple years ago. It's a lot better than the first version they had. I have several mats, including the US Presidents and a US Map tucked away at home. I started bringing them to my Girl Scout meetings and throwing them out on the Art Room tables before the girls arrived. The solar system is not a subject I've had to force on them. The handbooks only do moon phases, but I had the girls checking spaceweather.com and playing Magnetosphere Tag by third grade. Last week I bumped them up to the Transit of Venus and the Venus pentagram while playing with Spirographs. I've had no hesitation in showing them a horoscope with the current transits on it either. It is the quickest way to explain orbiting position and speed. They grasp 'where' they are in a different way then most kids. I've always considered Pluto a proper and dignified planet. The IAU should have grandfathered it in to the current list. I grew up studying the 9-planets quite a bit in primary school. On the rainy days we'd be home from school, my buddies and I would study the Solar System in great detail and if we got lucky, the evening would clear and we could play with our Edmund Scientific telescopes in the evening. I remember BS-ing the whole neighborhood that I could find Uranus and Neptune. But all I really did was defocus a bright star! If the weather stayed bad, we'd play Saturn Navigator on the Apple II+ computer we had. Or perhaps use The Planetary Guide. Well, today it is Stellarium and Orbiter on a modern PC. Anyways, back to Pluto - it's been a planet so long why change it now? It's not like it's "bad science" or anything, just a categorization, that's all. There's plenty of other objects in the Solar System to put into categories without having to steal Pluto and place it there. It's like an old friend. And the Solar System seems incomplete without it. Pluto was a planet for what? 50 years? That's really not a long time in the solar system, or even the historical, scheme. Ceres was a planet for a couple decades, too. Bet you don't miss it, just because its time as a planet was before you were alive. Kids learning the solar system without Pluto will do just fine without it. Is planet Juno visible in the last image or is it too small? If it is large enough to be seen in that scale, which one of the planets it is? And where are the moons? I am here for finding free google play gift card codes. I am giving a presentation to our local Astronomy Society on online astronomy courses (including Science of the Solar System). May I have permission to use an image of your planets placemat, please? I've been spending a lot of time on a proposal to change the status of Pluto. If an object must be massive enough to "clear it's orbit", vague rule if I must say so, then why do the planets sharing their orbits with asteroids (mainly Mars and Jupiter) have planetary status? Sure, they're much more massive than the asteroids, yet Pluto is also much larger than the various other KBO's in its proximity. Following the flyby of Pluto from New Horizons, we have a new understanding of the body, including the discovery of clouds in its thin atmosphere, and the revelation of its size being larger than any other KBO. So if Pluto's orbit isn't "clear", then why are the planets who also share their orbit with smaller objects have planetary status. It begs the questioning. But who's gonna listen to a twelve-year-old? Oh well. As I mentioned to someone else in a reply to their post... 1:1 resonant co-orbital objects effectively count as "cleared" anyway, as they're a type of quasi satellite, and most of them cluster around the Lagrange points - which indicate that they're being influenced by a combination of gravitational forces from the sun, and the main planet in that orbit. Even those which are retrograde QSes and thus nominally detached from the primary planet, or are in either horseshoe or travelling "bean" / "tadpole" orbits (whose relative position to the primary oscillates on a two-factor basis - the minor planet around the centre of the apparent relative orbit itself, and the orbit around the sun in relation to the major planet) appear to be mostly influenced by the primary as the retros stay fairly close to (or at least seemingly centred on) the planet - even if not directly affected by its gravity, it's a sign that it's just outside of that zone of effect, technically therefore not actually in the primary's orbit, and if it came any closer it would be cleared by other methods (capture, collision, deflection) - and the horseshoe/sliding sub orbit crew move in a kind of "anti orbit", doing everything *except* spinning around the primary and indeed avoiding that by seeming to "bounce off" at each end of the track (actually an illusion, like much of the rest of their orbits, caused by the primary pulling on them and changing their path subtly so that a minor that was falling behind then ends up accelerating away, and vice versa, just enough to avoid either circling or colliding with the primary, without being deflected any further than is necessary to do so. The clearance refers to there being little or no significant bodies scudding around in a less controlled fashion throughout the orbit... consider Saturn's rings and their shepherd moons. It works in much the same way there, just on a much smaller and localised scale. Funny, I've ended up here, though an extremely roundabout ramble through wikipedia and the like, because I've been trying to come up with a similar illustration to show the main dwarfs in comparison with the major planets proper (forgoing the sun, really), as well as the largest moons of each. Just getting the pertinent figures together has been a bit of a trial, as data on anything smaller than Mimas or further out than Pluto (...including all the other plutoids and officialised/"accepted but not official" DPs) seems very vague, fragmentary, and prone to serious "Chinese whispers" effect (EG some idiot writes down the diameter as just "size" or "dimension", someone else blindly takes that as meaning radius without checking the source, then later on similar happens after someone has "correctly" doubled up the radius to produce a diameter figure... or they completely fail at understanding Standard Form when writing the mass... etc), meaning I've ended up becoming responsible for actually tidying up some of the publicly accessible / editable data itself for certain bodies, when all I actually wanted to do was go to Wikipedia or the like and copy down a few numbers. On top of that, there's the obvious problem that even including the top two or three dozen objects provides a size... ahem, sorry, RADIUS range of at least 100x and more likely 1000x once you include a reasonable amount of things beyond the primary 8 planets (plus the moons that are either bigger than Mercury, or range from there down to Luna). Heck, Jupiter to Luna is already something like 40x, thus making Jupiter pretty chunky even with the moon a mere 16 pixels across (equivalent to a "small" Windows icon or website favicon/tabicon image), on which scale Pluto would be more like 10 and Charon about 5 to 6, and even Mercury only about 23. And of course the distances, which make a mockery of everything. My current preferred option, and it might even be what the placemat publishers went with (with the slight hiccup of scaling Saturn's *rings* to be the size its actual globe should have been), is to use separate scales for the size and the distance, and to use some kind of logarithmic or exponential scaling for the apparent size of and distance between objects, which still gives an idea of where they sit relative to each other (and the different groups and how they're separated) in both cases, in a generally familiar and scientifically acceptable way. I'm just trying to work out - or will be, once I've got enough valid info to even decide what to include and exclude! - which of several different scales to even use. Log10? Ln? Square (root) law? Cube, even? And is there any method whereby the mass and/or gravity of each could be used as a scaling feature? Arrrgh. It was just supposed to be a fun little project to try and help the layperson better understand the layout of the most significant objects in our now much richer view of the solar system (vs the very much more rudimentary one of 25+ years ago, that is yet still what most people seem to get taught), down to the size of the smallest of your 8 "accepted" DPs (after all, that's quite neat, isn't it? 8 regular and 8 dwarf planets, plus any moons down to that lower bound? I think it came out as a fairly neat 50 objects overall, most of them giant-planet satellites, so not too much to handle)... but it's turned into a right monster.